Chorizo de Bilbao is a spicy, tender and juicy Spanish sausage generally made from pork and beef with lots of paprika. This sausage is popular in Spain and in the Philippines and many Filipino dishes with Spanish influence contains Chorizo de Bilbao. Making this sausage is not as hard as you think. The only thing is that is requires at least 4 days of curing time to make it. Maybe that is the reason why it is more expensive than a regular sausage or longganisa. 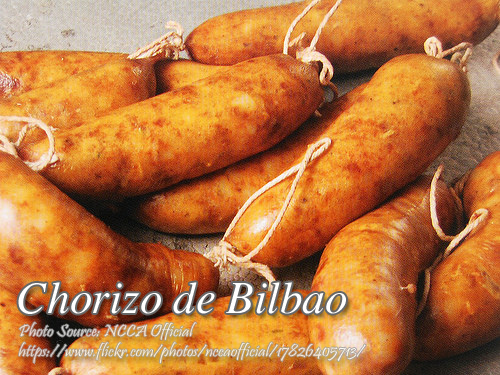 I also wonder why it is called Chorizo de Bilbao where “Bilbao” is a municipality and city in Spain. The ingredients are basically the same as the pork longganisa, only the amount paprika in the ingredients and the way it is prepared makes the difference. Brown garlic in oil. Add garlic and oil to the ground beef meat, pork meat and pork fat. Add the rest of the ingredients (except cooking oil) and mix well. Fill in longganisa casing. The chorizo should be at least 4 inches long. Keep in the refrigerator for 3 days. On the 4th day, place in pan, cover with water and boil for 10 minutes. Prick with fork to eliminate air bubbles under the skin. Drain. Set aside broth. Dry in the sun for a day or dry in the oven with a low heat (200 °F) for 2 hours. Place again in pan. Pour back broth (where chorizos were boiled). Add ¾ cup cooking oil or shortening. Simmer until the liquid dries and only the oil is left. Turn several times while cooking. Cool and arrange in a container with cover. Pour in oil. Keep in the refrigerator. Great job!! But I have a question? How much water do you use to boil the sausage? Hi Oscar, the amount of water is not important. Use just enough to cover the sausages. I think 3 to 4 cups is enough.